SatoshiMines Review: Go for the GOLD! 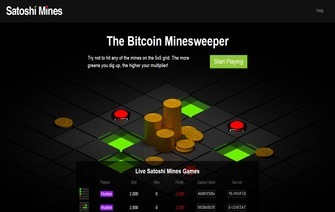 Satoshi Mines is a secure Minesweeper website that allows guest to bet while playing using Bitcoins. This particular company allows you to select how many mines will be present on a individual map which changed the payout structure. Depending on how many mines you select and successfully able to miss while playing will determine how much you will win. Currently the site does not provide a reference form to show what pays out what and will update this tread once they respond. You can select as low as one or up to 5 mines per map but by default is 3. Instant payouts comes to mind right off the bat regarding perks this Minesweeper company offers. Although it’s becoming more common for bitcoin gambling sites to offer such there is still over 50% of gambling sites that do not offer this perk so yes it should be considered as a positive on why you should join and try your luck here. Another really cool feature is the fact you can play on your mobile device. If your at the airport or possibly waiting to see the Dr your able to bet real bitcoins on your cell phone. The absolute best perk or feature would be based on the fact they offer all guest a fair gambling experience. There is not more chances of being scammed while playing with a Minesweeper website as we have verified the legitimacy of the provable fairness provided on the website. Game hashes are used on each and every game tile and makes it impossible for the company to cheat while playing. There is no possible way the company could cheat guest or tamper with the mine locations using this feature. The customer service provided from Satoshi Mines is top notch. We have emailed them today and previously and they have always been friendly and highly professional while dealing with Bitcoin Casino Pro. If you ever have any questions or concerns you can email them and they will get back to you within a short period of time. They can be reached via email only so it would be nice if they would add a chat or live help feature directly on the website. Currently Satoshi Mines does not offer any form of signup bonus or free bitcoin tryout. You can however play the game for free to get a better aspect on what you should expect prior to actually depositing any bitcoins. Here is a table that goes over exactly what each game could pay you. We are impressed with what Satoshi Mines offers guest and from a personal experience has always been positive. We are going to initiate this company with a decent rating based on the Provable Fair game play and the great customer service they provide. This company has a great chance of becoming one of the rare elite with good rating shortly down the road. Bonus There's no sign-up bonus but all the new players can try the "Mines" game for free and get used to the game before playing with real money.